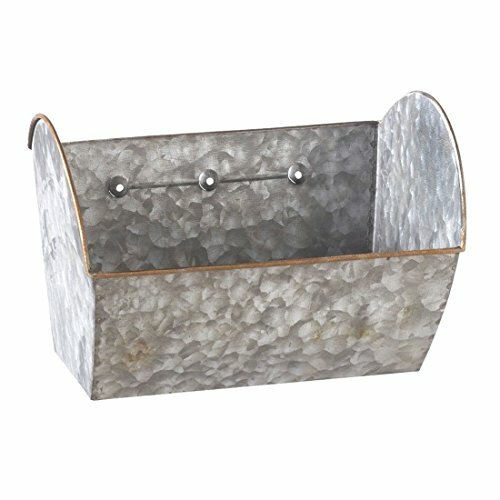 Add an antique look to your décor with this versatile galvanized metal wall pocket. Use as a planter for succulents or herbs, for storage and organization in the kitchen or laundry room, or as a decorative accent on its own. Three screws and three anchors are included for hanging. Measures 8.5" long x 5.5" wide x 5.5" tall. Antique style wall pocket can be used as a planter or for storage & organization. Measures 8.5" long x 5.5" wide x 5.5" tall. Adds a vintage look to your home or office decor. If you have any questions about this product by CBK, contact us by completing and submitting the form below. If you are looking for a specif part number, please include it with your message.